Winner of an American Educational Studies Association Critics' Choice Award and Choice Magazine's Outstanding Academic Book Award, and voted one of Teacher Magazine's 'great books,' Other People's Children has sold over 150,000 copies since its original hardcover publication. This edition features a new introduction by Delpit as well as new framing essays by Herbert Kohl and Charles Payne. 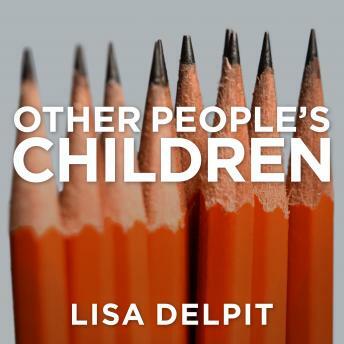 In a radical analysis of contemporary classrooms, MacArthur Award-winning author Lisa Delpit develops ideas about ways teachers can be better 'cultural transmitters' in the classroom, where prejudice, stereotypes, and cultural assumptions breed ineffective education. Delpit suggests that many academic problems attributed to children of color are actually the result of miscommunication, as primarily white teachers and 'other people's children' struggle with the imbalance of power and the dynamics plaguing our system. I think that this book is a must read for anyone who deals with the well being of poor children. There is so much truth here and everyone should be exposed to it.